An Indiana Farmer praises shoulder stem cell therapy with Dennis M. Lox, MD, on WTWO Channel 2 –Terre Haute, Indiana. Jim Virotsko a Rockville, Indiana native did not want shoulder replacement, which was the recommendation of an orthopedic surgeon. His wife had heard about stem cell therapy that had helped a patient who had a bad outcome with knee replacement surgery. 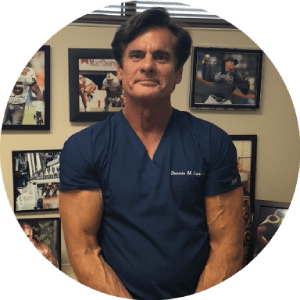 This lead the Florida woman to seek out Dennis M. Lox, MD, a Sports and Regenerative Medicine expert for consul regarding stem cell therapy for her other knee. Dr. Lox performed the stem cell treatment and she improved. Mrs. Virostko then obtained Dr. Lox’s information from WTWO and subsequently, the Virostko’s traveled to Florida to see Dr. Lox. Jim elected to have stem cell therapy on his shoulder, which was successful and then WTWO did a story on Jim. Regeneration implies repair. There are obviously various degrees of repair or regeneration in the utilization of stem cells for the treatment of musculoskeletal disorders. Some may not have overt changes on radiographic images such as x-rays. Stem cells exert an immune regulatory effect which may alleviate inflammation which is causing degeneration. This is one aspect of how stem cells work in a regenerative fashion.